What a sad day, God bless Bobby, a great character, a pure genius, the best all time chess player, what a sad day indeed. 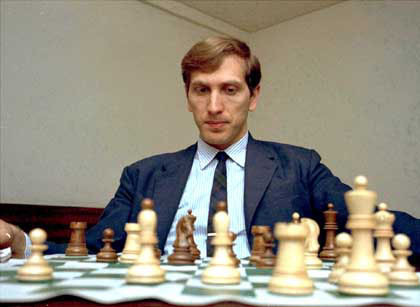 He was the greatest chessplayer in the world in my opinion, I'm only sorry he was so against the U.S. YES THE KING IS DEAD. DO YOU THINK THE BIASED USCF WILL PUT OUT A COMMERATIVE ISSUE.... ALL THEY EVER WANTED TO DO WAS KNOCK HIM DOWN AFTER HE MADE A PERSONAL STATEMENT AGAINST JEWS, OF WHICH PROBABLY USCF IS TOP HEAVY WITH. A REAL LOSS TO THE WORLD OF A TRUE ICON.